The villa is stone built, in traditional way. Outside there are 2500 square meters of private yart and gardens, BBQ, a dining table with 6 chairs under a pergkola with shade by the pool and an outside shower next to the mosaic infinity pool. No matter the angle, the view is astonishing. Inside, there are 2 air-conditioned bedrooms,an attic with a double bed and 2 bathrooms, a full equiped open plan kitchen with a dining area and living room area.The decoration is artistic and there are hand made pieces of art. The mattresses, the linen, pillows and the towels are hypo-allergenic and high quality. The huge shade area with curtains offers a fantastic view of the port of Gaios and of the Ionian sea, which will give you the serenity you were looking for.. Please contact as to check discounts at the rates. Hi there.We are the owners Vasia and Andreas a couple with twins 6,5 year old. Vasia is an art teacher many exhibitions in Greece and other Europe countries.The villa is decorated and have inside oil paintings,carvings and mosaics handmade by Vasia. Andreas have a shop at Paxos since at 1993 and villa is located in a hill which belong in his family many hundreds years ago. .The land is property of Andreas' family, for many generations now, and it has always been a personal dream to build a house at this wonderful place. With the great help and art of my wife, Vasia, this big dream is now reality and it seems even more like a dream..
.The Lilac Lilium Villa is located in one of the best places of the Island, just a few minutes away from Gaios, but in a calm and private enviroment. From your balcony or while swimming in the pool, you can survey the entry of the Gaios port village, with the fishing boats and the luxury yachts. It is an ideal villa for couples and small families and a really unique destination for honey moon. Bathroom 1 Features: Toilet, Shower Enclosure Bathroom 2 Features: Toilet, Shower Enclosure All bathrooms have a shower cabin. The one of those is ensuite. Also, all bathrooms provide high-quality, hypo-allergic towels, free hand soap, shampoo, shower-gel samples and hair-dryers. Wonderful, high-quality, hypo-allergic, 100% Egyptian cotton towels. Full kitchen equipment. The kitchen provides a cooker, oven, microwave, refrigerator, coffee machine (filter and espresso) , dishwasher, toaster, kettles and multi-chopper. There are 2 different dining areas, one inside, a second one at a shade area,next to the pool with a fantastic view. Please contact as,to find out about a better rates we can offer you. Utility Room: There is a covered washing machine at the yard. Cleaning / Towels / Linen / Maid service: General cleaning 6 times per week and linens changed 3 times per week. Property and owner (Andreas) were absolutely fantastic! Beautiful villa, even nicer than the photos. Andreas is a very kind and generous host. 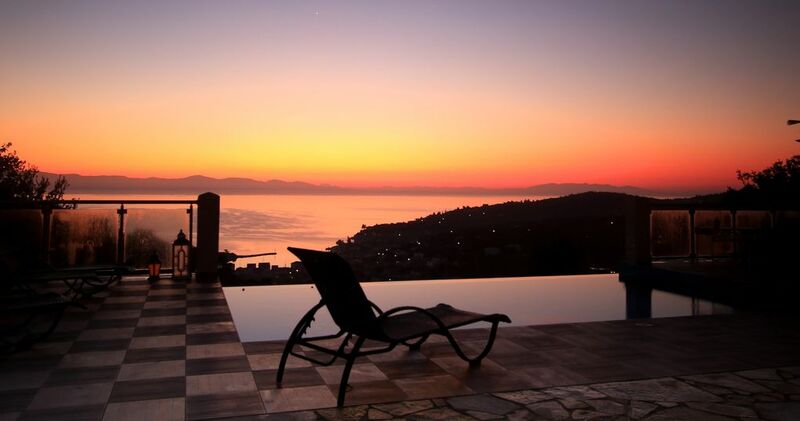 The villa has a perfect layout, it’s furnished and decorated beautifully, and has the most amazing views of Gaios and the sea. It is up a steep hill, but walking distance of the shops and restaurants. We hired a car for a few days so we could visit Lakka, Loggos and a few beaches - although I believe there is a good bus service and water taxis. We also hired a boat for a day and it was fantastic to go all around the island and see the caves, and beaches at Antipaxos. Andreas is a wonderful host who helped us to the villa with our luggage and showed us around. There was a very generous gift basket of goodies and a wonderful housekeeper who was very unobtrusive but visited daily to clean and tidy up. The villa is even nicer than the photos and is decorated to a very high standard with some lovely artwork by Andreas’s wife. The infinity pool must have one of the best views in the world. All the restaurants we ate in seemed to be of a very high standard. We had a couple of barbecues at the villa with very reasonably priced pre-made kebabs, stuffed peppers and mushrooms from the local butchers. The supermarkets will deliver to the villa (as will one of the Taverna’s). There are only a few taxis on the island and we were struggling to get one to take us to the port for our early ferry when we were leaving and Andreas very kindly offered to help - it’s not too far but would have been a struggle down the hill with our luggage. This holiday far exceeded our expectations and we truly hope to go back one day! If you want privacy and tranquility, Villa Lilac Lillium is the one for you. It’s location just above Gaios has the best sea view and is situated only 5 min drive from Gaios new port and the town centre. If you feel energetic you can walk down in 15 min to the many shops and tavernas, but be warned that your returned walk is up a very steep hill, a car rental is highly recommended. The villa is appointed to a very high standard and decorated in a colourful and artistic style. Andreas the owner couldn’t have been more helpful, he gave us loads of useful tips on the best places and beaches to visit, also recommended us with excellent tavernas, We fell in love with this villa and Paxos. Thank you Andreas for a wonderful holiday. The villa of the very helpful host Andreas is a great place overlooking the Gaios port. Nous avons passé une magnifique semaine sur l'île de Paxos et dans la maison d'Andreas. Avant notre arrivée il nous a aidé pour la location d'une voiture et les informations concernant notre arrivée à Paxos. Une fois sur place, il nous a accueilli chaleureusement. Andreas a été attentif au bon déroulement de notre séjour jusqu'à dans l'urgence. En effet notre bateau de retour sur Corfu a été annulé à la dernière minute et grâce à Andreas nous avons pu trouver un bateau qui nous permette de rejoindre Corfu et de ne pas manquer notre vol de retour. MERCI encore! La villa offre une vue magnifique sur Gaios et la mer. L' espace intérieur et extérieur est très confortable et la piscine est magnifique même si un peu fraiche fin octobre. Mieux vaut à cette période profiter de la température agréable de la mer. Nous recommandons sans hésitation cette villa tant pour son confort et sa vue que pour la gentillesse de son propriétaire. Nous conseillons tout de même la location d'une voiture qui permet d'explorer cette magnifique île. We travel a fair amount each year, and are no strangers to hiring apartments and cottages, but Villa Lilac was different. It is seldom that we stay at a property and think that for two weeks (apart from my scratching the hire car!) there was not a single thing that we would have changed or wished for. From the evening that Andreas the owner of the villa met us at the ferry, till he so kindly met us at the harbour at dawn to say goodbye, he was the perfect host. The villa is in perfect order, very well equipped, with a powerful wi-fi connection. The quality of the fittings is high – offhand, I cannot think of anything that we needed. It is serviced and kept spotless almost every day by Lora, who was cheerful and helpful. Villa Lilac is situated about a kilometre from the town of Gaios, up a (very!) steep track, some 50m from Andreas’ other villa on a hillside overlooking the town. Surrounded by oak trees, scrub and olive groves, the fabulous infinity pool and poolside dining area is totally private. Because of its location, you really need a hire car. I would recommend Angelo’s to hire from, but be sure to establish the terms of insurance before you turn a key. The view is stunning. It was a delight to get up at dawn each morning to watch the loom of the sun break over the distant Greece coast and reach towards Paxos. Of the three towns on Paxos, Gaios is the one to be near – there are many restaurants, bakeries and shops to visit, plus an ever-changing harbour side as the yachting flotilla’s come and go. The other two - Lakka and Loggos - are certainly worth visiting. Each has a special charm. We are boat savvy, and hired a planning motorboat from Spyros Boat Hire in Lakka most days. I can’t recommend him enough – knowledgeable, helpful and most helpful, with well-equipped easy to use boats. The boat took us to those hard to get to coves, and also South to the little island of Antipaxos. The coves there are stunning, and a day at anchor swimming in your very own cove with fish for company, is unforgettable. In summary, one of the best breaks that we have ever had, largely due to a beautiful Villa, and a perfect host. I really believe you was a perfect guests which any owner will love to have at his rental villa. With my pleaseuer will wait to see you again and to drink some wine from Antipaxos with you. Quiet Island with fantastic clear sea waters, sea caves and lonely beaches(you can rent a boat,diploma is not necessary),old paths for walking under the 500 hundred years old olive trees. You have to visit Lakka,Logos and Magazia villages and absolutely Antipaxos island(3 miles away)which have 2 of the most nice beaches in the world. (Names Vrika and Voutoumi to take a look at internet). Nearest Beach: Giannas, 700 m.